CSMUN delegates at the third annual Kent School Model UN Conference. Left to right, bottom row: Joyce Gao ‘20, JiWon Lee ‘20, Sydney Thomas ‘22. Left to right, top row: Sabrina Capodicci ‘20, Jerry Liu ‘22, Yurou (Sonia) Li ‘21, Peyton Hall ‘20, Katelyn Pizzano ‘22, David Salazar ‘22, Ian Fernandes ‘22, Steven Luo ‘19. 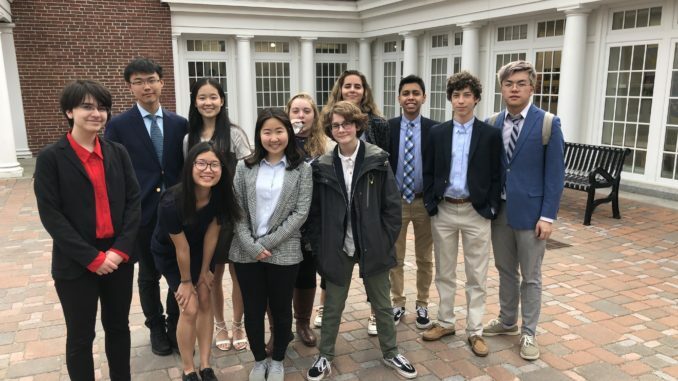 After extensive preparation beginning long before March break, Canterbury School Model UN (CSMUN) delegates saw their hard work pay off at Kent School’s annual conference last Sunday, April 7th. The conference saw students from three schools—Canterbury, Brewster, and Kent—gather to discuss problems and search for solutions. Delegates were divided into three committee meetings: World War III Crisis, Apalachin Meeting of 1957, and UN Security Council on the Korean Peninsula. Talented attendees from Canterbury included veterans Joyce Gao ‘20, Steven Luo ‘19, Ji Lee ‘20, Yurou (Sonia) Li ‘21, Ian Fernandes ‘22, Sydney Thomas ‘22, Jerry Liu ‘22, and Katelyn Pizzano ‘22 as well as first-time delegates David Salazar ‘22 and Peyton Hall ‘20. After a light breakfast, delegates settled in for opening ceremonies. The keynote speaker was none other than Dr. Sergei Kambalov—the former UN official who spoke to Canterbury students and faculty at an event in the fall. Once again, students were impressed by his important moral insights that sparkle with wit and humor. Delegates then dispersed into three separate rooms to begin their discussions, which continued after a lunch break until 3:45 p.m. Drawing upon research and writing they’d prepared in the weeks before, they debated, drafted documents, and responded to simulated crises. In the end, the World War III committee managed to rebuild the U.S. government after a devastating attack and resurrect ties with the opposing side, China—as China absorbed the US South into a new United States of China. The Apalachin committee, a gathering of Italian-American mafia bosses in the 1950s, created a conservative—yet shockingly feminist—code for their organization in a meeting peppered with assassination attempts. The Korean Peninsula committee saw the Democratic People’s Republic of Korea and the U.S. compromise on a denuclearization deal—which quickly descended into illegal annexations and war.